Intrinsic Imaging is ISO 13485 certified to provide Imaging Core Lab Services for Phase I-IV Clinical Trials and Class I,II, III Medical Device Trials. While all companies state they are committed to quality, only Intrinsic Imaging has the most comprehensive and sophisticated quality management system in the industry. Our quality management system is FDA audited, ISO 9001, ISO 13485, ISO 22301, IOS 27001 and ISO 27018 certified and GAMP® 5 compliant. Our ISO 13485 Quality Management System is specifically for providing imaging core lab services for Class I, II and III Medical Device trials in support of 510(k) and Pre-Market Notifications. Intrinsic Imaging’s ISO 13485 certification demonstrates our ability to provide imaging core lab services that consistently meet customer and regulatory requirements applicable specifically to medical devices. 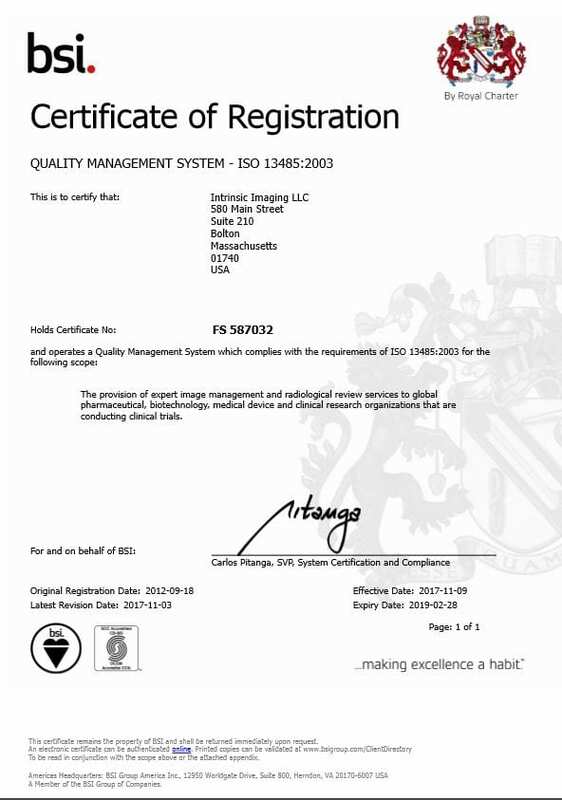 Certified by the British Standards Institute (BSI), Intrinsic Imaging’s ISO 13485 quality certification is applicable across the entire organization for all Medical Devices.